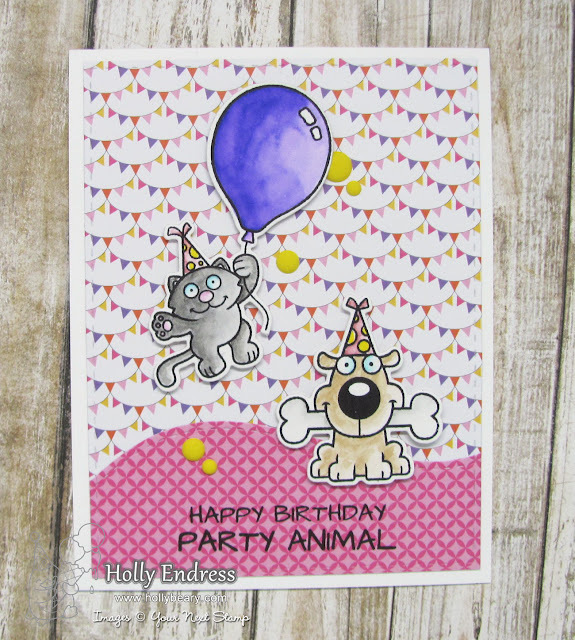 Hollybeary Creations : YNS 8th Birthday Blog Hop!!! Happy Saturday everyone... 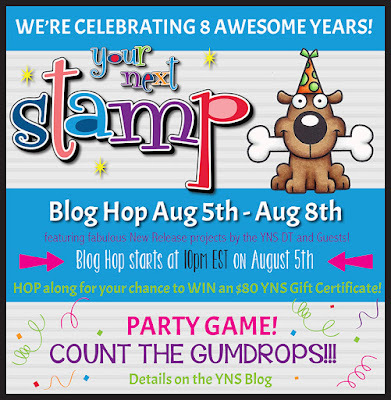 It's time for the Your Next Stamp Birthday Blog Hop!!! YNS is turning 8 and this month's release is full of Fun Birthday themed products. I'm sharing two projects with you today... My first features the Super Cute set Party Pets and the New Birthday Girl 6x6 Paper Pad and some Nautical Matte Gumdrops. My second project shares the new All Abord Zoo Train and Coordinating Die Cuts. I also used the coordinating All Aboard & All Aboard Traing Carts Sets, which is perfect for this set. This month's Blog Hop is a celebration so of course, we have some Great Prizes and a Sale !! 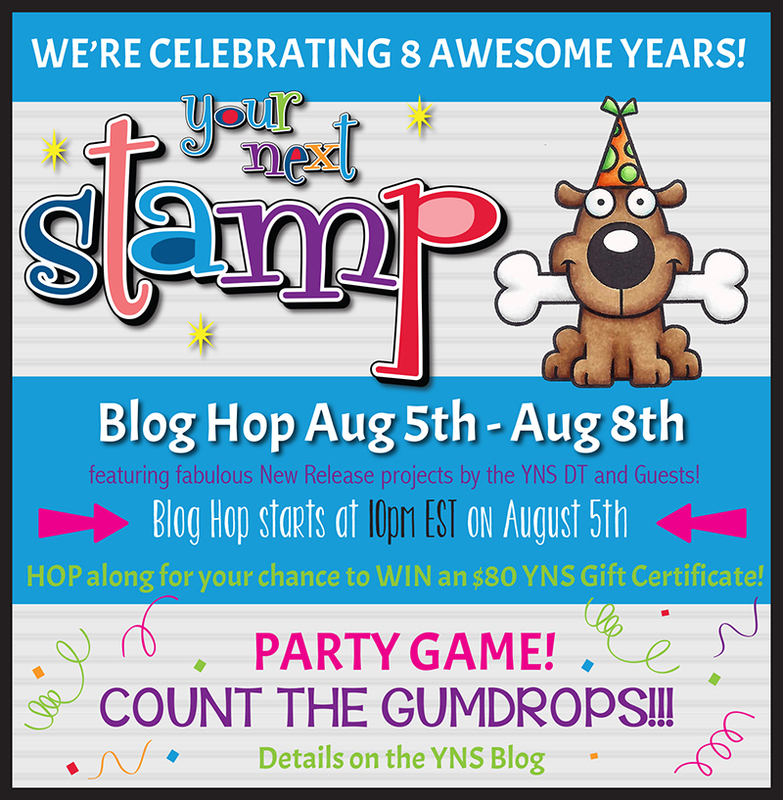 Count the gumdrops as you go and enter the total in the Party Game inlinkz on the YNS blog at the end of the hop. One random entry with the correct # of gumdrops will win 10 packages of gumdrops. If no one has the correct # then the closest without going over will be the winner. Are you ready to Hop Along? Love the cards. The train card is so sweet. All the different animals are so cute! Adorable cards! Love the appearance of texture that the scalloped birthday banner print gives to your first card's background. Awesome job on both! Very fun cards! Love the Party Pets! These are awesome! Love them both! Cute cards love the animal train they are both really cute. Such adorable creations Holly. I love your long train card. Cute critters, both are sooooo lovable! What a cute zoo train card. What cuties and what a fun train! I don't know which cute card I like best - they are both awesome! Love the critters, the new papers & your designs are AWEsome! Super cute, your second card is stinkin' adorable! Oh my goodness Holly, I love both cards but that train is just WAY TOO CUTE! The zoo train is just precious!!! What a festive birthday card! I love the use of patterned paper. Wonderful cards. I especially love the Zoo Train one. It's so fun. Holly, your cute little train is so cute! I love all the birthday animals having such a great time! Adore the zoo train. Brings back memories of riding every train we ever saw when my son was younger. Such great cards! Your train card is so cute!! Love both cards,but especially the train set. FUN cards! Love those Party Pets! These are adorable cards!That train is so cute! I need to get more stuff to make kids cards. They are so fun. Love your cards! So cute! Love this new stamps set with the little animals! So cute! Love your adorably sweet cards Holly! What a great couple of projects for the Hop. The sets are already stuck in my head as "need to have". Great job. I like the fun cards you created. Both of your creations are so cute! I just love the dog holding the bone on your first card with the new papers, but the train is over-the-top adorable! I love how you colored all the pieces to create your own train, complete with track and animals in the cars!! I would love to hop on that train, it is super adorable. Oh my gosh, your cards are just adorable and that animal train is really sweet. The seal with his beach ball makes me laugh! Great cards! Love the animals on the train; too cute! Too cute!! Lovin that puppy!! Tha train is really cute! I can see it in a trifold card. Love the kitties! 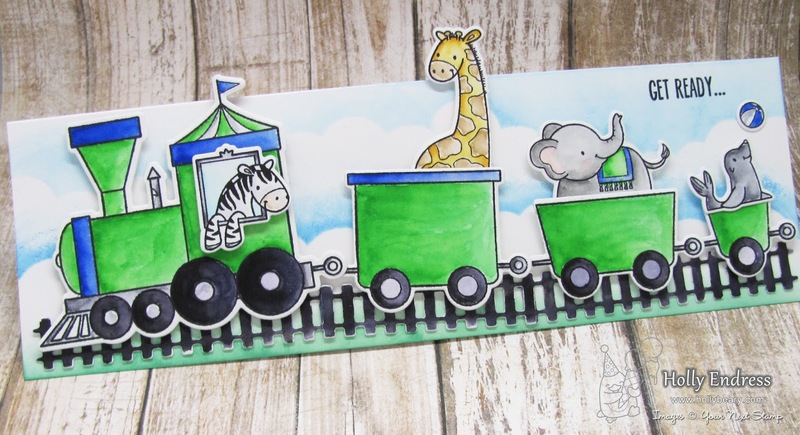 Wonderful cards, love the cute train and the way you used the new pattern papers. Both projects are fabulous! Love the new critter stamps and the new papers! love the background on the dog card, and your train is awesome!!! These are both sooooo adorable!! Love your little train; so cute! Super cute cards! That balloon kitty warms my heart! I love animals! Your train is awesome. Thanks for sharing. Two gorgeous cards and love the design shape of the second one. The first one is so beautiful and love the papers too. Awww!!! Both your cards are absolutely cute!!! Such lovely cards.. the train card is so cute.. I loved the background of the first card too! wow both cards are so cute. I love the adorable images on the first and the cute train on the last. These cards are so cute! Love your pairing and use of the patterned paper in the first card. Love both your Gorgeous Cards and the Colours are Awesome!